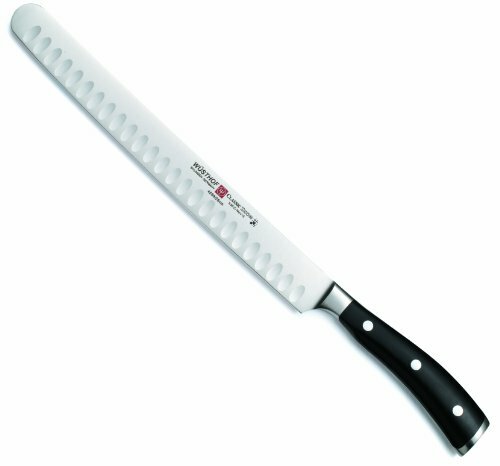 Wusthof Classic Ikon 10-Inch Roast Slicer, Black by Wüsthof at Sara Stage. MPN: 4538-7. Hurry! Limited time offer. Offer valid only while supplies last. The Wusthof Classic Ikon roast slicer is definately the tool of choice for cutting large hams or roast. This knife cuts thin, uniform slices. The Wusthof Classic Ikon roast slicer is definately the tool of choice for cutting large hams or roast. This knife cuts thin, uniform slices. Oval-shaped kullens in the flexible, narrow blade prevent the fish from sticking or tearing while slicing. Classic Ikon is a culmination of all the best features of each of the Wusthof knife lines. The combined riveted handle design is combined with a contoured shape to add comfort and control. The Classic Ikon adds a rear bolster that acts as a counter balance when using the knife. This second bolster adds significant blade control. Classic Ikon has a unique forward bolster as well. The forward partial bolster is designed so you can sharpen the complete length of the blade. This bolster is also curvered inwards to allow your fingers greater control while holding the knife by the blade. Located in The Cutlery Capital of the World, Solingen Germany, the Wusthof factory history goes back as far as 1814 when the company was listed with the Duchy of Berg. To this day, the company remains family owned. Throughout it’s history, Wusthof has focused almost solely on the manufacturing of forged knives for the professional chef and home cooking enthusiast. Wusthof uses a special blend of German steel through out the whole length of the knife. The ingredients of this steel are proudly etched on each blade. Wusthof not only uses the best materials to make a fine knife, but it is also crucial that each blade is precisely tempered. This tempering allows the knife to hold its edge for an extremely long time, yet still be able to be maintained in your home kitchen with out the need to be sent away for maintenance. Our unique compound angle is not seen in many knives. This angle tapers from the spine of the knife to the edge to allow for a sturdy, yet extremely sharp edge while it also tapers from the bolster to the tip to give the knife strength as well as flexibility. View More In Carving Knives & Forks.